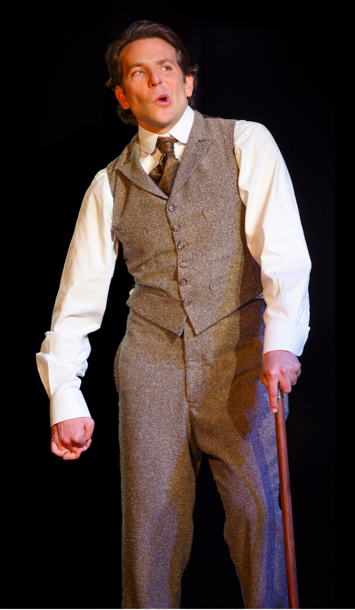 For an actor like Bradley Cooper, the appeal of playing Joseph Merrick in The Elephant Man is pretty obvious. The 19th-century sideshow act-turned-society darling offers one seriously showy role, requiring contortions of the body and face as well as a dramatic death scene before the final curtain — but no facial or bodily prosthetics to obscure the physique of People‘s one-time Sexiest Man Alive. (Unlike David Lynch’s 1980 biopic of Merrick, Bernard Pomerance’s 1977 play requires its lead to merely suggest Merrick’s physical deformity.) It’s a rare opportunity to “play a mental,” as a potty-mouthed Kate Winslet put it in a memorable episode of Ricky Gervais’ Extras, without having to look like one. And for the former New School drama student who pops up in old Inside the Actors Studio episodes looking wide-eyed and overeager, like a male Tracy Flick, there’s the bonus requirement of lots of technique to demonstrate his acting chops. Cooper gained mainstream fame in the raunchy Hangover comedies that played off his pretty-boy alpha-maleness. But despite back-to-back Oscar noms for the last two years (and a decent shot at a third straight this year for Clint Eastwood’s American Sniper), he has always seemed somewhat defensive about his matinee-idol status. Nonetheless, he’s sensational in Scott Ellis’ solid Broadway revival of The Elephant Man — which first played two summers ago at the Williamstown Theatre Festival with much the same cast (as well as Timothy Mackabee’s simple but effective sets). Indeed, the role of Merrick proves a perfect showcase for the star’s talents as well as his insecurities. Early on, he stands before us in boxers, with a gym-toned and shaved chest, and proceeds to contort himself into Joseph Merrick before our eyes. As the upright and somewhat priggish Dr. Frederick Treves (a stalwart Alessandro Nivola) catalogs the particulars of his physical condition, Cooper gradually takes on each aspect in turn as he stands beside the projected image of the real-life Merrick. It’s an astonishing transformation that extends to his guttural vocalizations (softened over time for clarity of communication). Cooper is not the only one who must emote up a Victorian storm. Patricia Clarkson (Six Feet Under) brings an impressive mix of self-satisfaction and vulnerability to another enviably meaty part, Mrs. Kendal, a successful actress who befriends Merrick and introduces him to London high society. Anthony Heald (The Silence of the Lambs) proves equally fine in dual roles as Merrick’s craven carnival-barker of a manager as well as an Anglican bishop who eyes Merrick with missionary zeal. Previous Previous post: Why is the new Annie a law-breaking juvenile delinquent?